O Christmas Tree: Where Did You Come From? Our American tradition of Christmas trees probably had its roots in Germany in the 8th century. St Boniface, the German apostle, brought a fir tree with him when he preached to the common people because he said its triangular outline represented the holy trinity. This was at a time when very few people could read and visual aids like his little tree were a big part of spreading the gospel. Devout Germans took this form as a real manifestation of the trinity and decorated their trees only with candles in the beginning. By the 15th century glass ornaments crept into view and in Latvia trees were even decorated with roses, associated with the Virgin Mary. 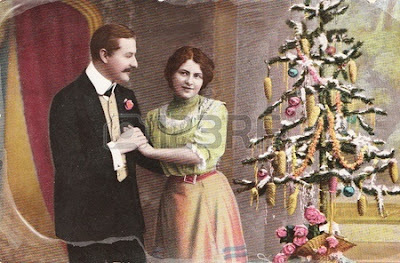 It has been documented that in Strasbourg in 1605, on the Rhine bordering with France, someone brought a tree indoors and decorated it with roses made of paper, nuts, candy and of course, candles. The Christmas tree was officially born.